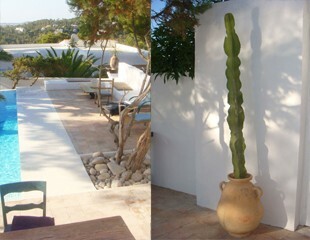 CAN VILLIZA is based in a cultivated urbanisation above the beach of Cala Vadella on the western coastline of IBIZA. Nearby you will find beach-restaurants, bars and some small supermarkets. Cala Vadella is a nice bay with a white beach and clear water. Perfect to relax and joining the day. The most beautiful beaches are only a few minutes away (Cala Conta, Cala Tarida, Cala d'Hort). Within 10 minutes you can reach the small town of Sant Josep. 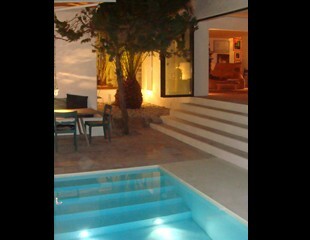 The house has 4 Bedrooms each with a bed of 180x200, 2 bathrooms en suite, 1bathroom to share and a guests restroom. 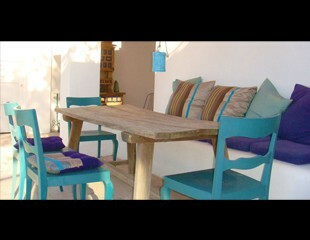 Outside you will find different Terraces with a large dining-area, a pool of 2,5 x 8 m, and two lounge- seating-areas. The kitchen contains a refrigerator, a gas stove with a electric oven and many kitchen utensils. We have a large indoor dining-area for 8 people and a large living room with chimney and TV. Also there is a roof-tarrace with about 80m² and a beautiful view to the landscape and the sea. The beach is only 5 minutes away by feet and its very friendly to small children. Did you stay in Can Villiza? Let us know what you thought about it and help others to make the right choice! * I confirm having stayed in Can Villiza. 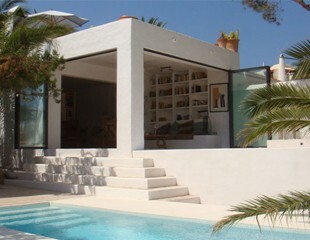 Find other bed & breakfasts in Balearic Islands.